Click here for current contests. Win US$1,000,000. Compete in the planet’s largest student competition to solve the world's toughest challenges. The Hult Prize Foundation is a start-up accelerator for budding young social entrepreneurs emerging from the world’s universities. Named as one of the top five ideas changing the world by President Bill Clinton and TIME Magazine, the annual competition for the Hult Prize aims to create and launch the most compelling social business ideas—start-up enterprises that tackle grave issues faced by billions of people. Winners receive USD1 Million in seed capital, as well as mentorship and advice from the international business community. 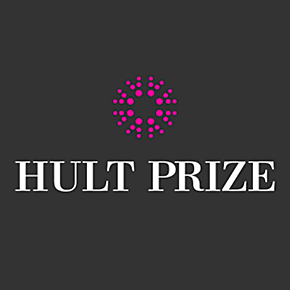 The Hult Prize is offered in partnership with Former US President Bill Clinton and the Clinton Global Initiative. It is hosted and supported by Hult International Business School. And it is generously funded by Swedish entrepreneur Bertil Hult and his family. It has been called the "Nobel Prize for Students" by media outlets world-wide. Each year, a critical social problem is selected by President Bill Clinton and a challenge issued. Teams of 3-4 students are challenged to develop a custom tailored innovative start-up enterprise to eradicate the problem. Access to Education. Clean water. Affordable housing. Clean energy. Solar Power. Food insecurity. Healthcare. These are a few of the issues competitors have tackled since the competition’s inception. * Details may apply. See contest website to confirm eligibility. Notify me of new challenges!